–Sharon Gannon, Co-Founder of Jivamukti Yoga. 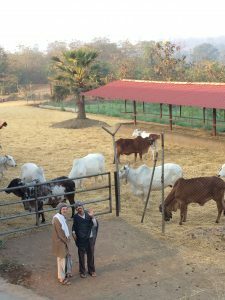 Govardhan Eco Village uniquely combines ancient Vedic principles of ideal human life and modern sustainable technology to create a revolutionary and progressive society. -To help cultivate an attitude of reverence and gratitude towards Mother Nature and all her children. -To engender a spirit of peaceful cooperation among living entities for the supreme good of all. -To give individuals a first-hand experience of our utter dependence on Mother Nature’s gifts. Women Empowerment: While focusing on a agro-horti-forestry based tribal development, there is need for a thrust to tackle the root causes of poor health and improve the quality of living, particularly of women. The focus of this program is to ensure food security and alleviate poverty by empowering women. Organic farming: Many technologies are utilized to create the most sustainable and environment-friendly food sources possible. Such practices as crop rotation and companion planting, composting, mulching, organic fertilizers, green pesticides, permanent raised garden beds, and several kinds of irrigation are employed in the farming effort. Green Buildings: Traditional earthen homes are built with locally available materials that reconnect us to earth, creating a healing and calming effect. Water conservation: Efficient Water conservation is a natural step towards sustainability with respect to water resources. The goal at GEV has been to create a system, which could help attain this goal without disturbing the existing ecology and keeping cost feasibility in mind. Alternative energy: Alternative energy is any energy source that is an alternative to fossil fuels with their inherent disadvantages like carbon dioxide emissions, global warming, etc. GEV uses Solar Power, Biogas and Bull Power to meet energy needs in an eco-friendly way. Soil biotechnology: Soil Biotechnology (SBT) is an indigenous green technology for sewage processing which enables recycling and reuse of processed water. SBT has been developed & patented by Chemical Engineering Department, IIT Bombay. GEV has been one of the pioneers in employing the SBT technology for handling sewage wastes in a rural setup. Animal care: Upholding the Vedic tenet of respecting all forms of life, GEV is working steadily towards setting up exemplary animal care facilities. Two donkeys, two goats, two sheep, four dogs and several cows and bulls happily reside at the GEV. Waste management: GEV uses a combination of time tested traditional techniques as well as indigenous innovations to develop a Symbiotic Model of Waste Management (SWMS). In a SWMS different processes or systems are integrated into loops so that the wastes of one system can be utilized by another. Rural empowerment: A Holistic Development Program for Rural & Tribal communities in Wada Block of Thane District was started by GEV to cover at least 500 tribal families over a period of 6 years. Rural health care: Bhaktivedanta Hospital and Govardhan Eco Village, as a part of their mission to serve the needy, have been rendering free and concessional community health services to the villagers in and around GEV. Annamrita: The Annamrita kitchen supported by GEV today provides mid-day meals to almost 30,000 students from 400 schools. Vrindavan Biodiversity park: Taking inspiration from the sublime and symbiotic biodiversity of Vrindavan, GEV is coming up with a Vrindavan Biodiversity Park. 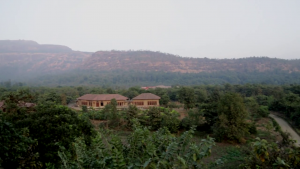 Sitting in the lap of Mother Nature, being surrounded by mountains on all 4 sides and with the Vaitarna River flowing nearby, Govardhan Eco village has an ideal setting to experience the sweetness of Bhakti Yoga along with the blossom of Nature. Cottage industry: Cottage Industry refers to small-scale manufacturing of select products; from the very beginning, Radhanath Swami has emphasized that cottage industry is one of the important aspects of developing self-sufficiency and a means of providing employment to the community residents. At present there are seven products produced at GEV, which include ubtan (soap powder), tooth powder, flour, incense sticks, and cooking oil. Plant nursery: Spread over an area of 3 acres, the nursery houses hundreds of varieties of flora comprising of ornamental plants, flower plants, fruit bearing plants, forest plants and medicinal plants. The nursery employs shade-net areas, poly houses, lotus ponds and several other facilities for growing these different varieties of plants. The plants grown at the nursery can be classified as Shrubs, Trees, Hanging Pots, Moss Sticks, Grasses, Creepers, etc. Govardhan Eco Village was honored at the 34th Skoch Summit in New Delhi. Skoch Awards are the highest independently instituted civilian honor in India, recognizing people, projects, and institutions for their extraordinary contributions to society. They are coveted due to the exceptional research and rigorous process of selection of the Skoch Development Foundation. The GEV was bestowed this distinction for its efforts in pioneering a novel “integrated water conservation and protection scheme,” which could prove to be a formidable way to tackle the water security issue in many underdeveloped nations.